Summer Camp is $110/week. $35.00/day. Pay by May 1st for entire summer & save $100. Price includes Pizza Monday, Kona ice, Swimming & a Camp T-Shirt! To assist working parents during those days school is not in session our Lakeland Summer Camp program provides day care for our Athletes as well as other, non Gym member families, who desire a wholesome family environment for their children ages 5-12. 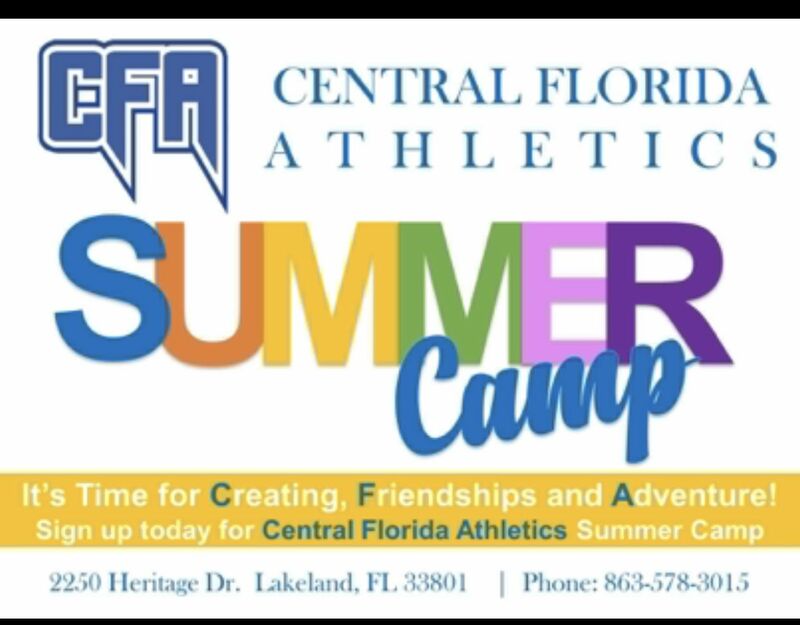 CFA’s Lakeland, FL camp hours begin with drop off at 7:00 AM and end with 6:00 PM pick-up.Central Florida Athletics’ Lakeland, Florida Summer Camp runs in tandem with the Polk County Florida public school systems summer break that begins May 28, 2018 and ends August 10, 2018. Lakeland Campers are sure to have Tons of Fun! We offer a variety of indoor and outdoor games including volleyball, tetherball, soccer, basketball, kickball and more! We also offer cheerleading, gymnastics, tumbling, arts and crafts, dance, swimming, movies, field trips, water slide days and more. We will keep your child smiling all summer long!! Register for half day, full day, or the entire week. $35 Registration Fee per participant or $70 Family Registration Fee for 2 or more participants. *Receive a free camp t-shirt when you register! Included in your weekly tuition is: Swimming once a week, pizza lunch on Mondays, and the movie field trips. There will be additional field trips scheduled and those will be at an additional cost. The field trips include: Lake Eve, Family Fun Center, Explorations/Children’s Museum, Medieval Times, Dinosaur World, Polk Museum of Art, Skate World and weekly pool days.